Quite a while ago I blogged about the Visual Studio / SQL Server install order on Windows Vista. I’m about to go through a similar exercise on Windows 7 and given the issues I had then I thought that it would be only right to document the procedure in case any problems arose. Last time, it would seem, the best solution was to install things in the order in which Microsoft released them with the notable exception of the operating system. So this time, that is the strategy that I’m going to take. Windows 7 is already installed on my laptop. Then I’m going to install Visual Studio 2008, then SQL Server 2008, then any patches for either and we’ll see how we get on. I’m also going to ensure that I do NOT install SQL Server Express Edition on Visual Studio 2008 as I’ve had problems with that before. Essentially, the problem last time was that the SQL Server installer mistook Visual Studio’s SQL Server Express installation has having installed certain things. The SQL Server installation therefore didn’t want to repeat what it didn’t need to so it refused to install the client tools. That’s it – Job done. And it only took me two attempts to get it right this time. My stumbling block here was the order in which I applied the service packs. @Mark I realise you can run SQL Server Express and the full edition side-by-side. However, I’ve had issues with the version of SQL Server Express included in the Visual Studio install. I should have been more explicit about that aspect.As for why VS2008 is shipping with SQL Server Express 2005 it is because that’s what was available when VS2008 RTM’ed SQL Server 2008 didn’t come out until after VS 2008. I imagine it would be quite costly to go back and RTM it all over again what with all the re-testing and so on that would be required. I have a fresh Windows 7 with VS2008 installed first. 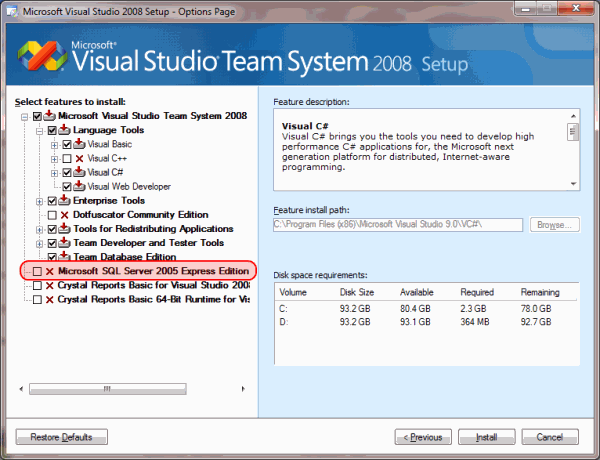 However, I simply followed the “default” installation so SQL2005 Express was installed. Then I tried to install SQL Server 2008 Developer but it always gives me the “Enterprise Evaluation” or “Express” or “Express with Advanced” licensing options. I even used SQL Server 2008 Enterprise or Standard ISO images but it always gives me the same choices. I have SQL2005 Express unintalled but it does not change anything. I also created a slipstreamed SQL Server 2008 with SP1 and used that and nothing has changed. May I know if you have any idea how to fix this? I ceratinly hope that I don’t have to uninstall VS2008 or even wipe out the whole hard drive and start from scratch again. Sure I will if I don’t have any other option. Just a quick note, I have not activated Windows 7 nor any of the Office 2007 apps yet. Thanks. @Nazim: It should be a similar procedure. You may also want to refer to my older blog post on installing SQL Server 2005 on Vista as it might also contain some useful information that would help you. Windows 7 is really just Vista with most of the issues ironed out.